I’m relatively new to watercolour painting. I’ve been teaching myself to draw and to paint since last September, and as it’s completely new to me and I knew nothing about art supplies to begin with, it’s been a steep learning curve. I have been vegan since October 2005 and my veganism influences not just what I eat, but what I wear, the cosmetics and household products I buy and use, and any products I use for work and my hobbies. Whilst the environmental benefits of being vegan are important to me and my academic background is in environmental science, I am vegan for animal welfare reasons first and foremost. I thought at first that it wouldn’t be too complicated to find vegan watercolour supplies. I assummed I’d have to be wary over certain red pigments (because of cochineal) and black pigments (because of bone char) but what I didn’t realise was that many of the artist grade paints contain a substance called ox gall which (correct me if I’m wrong) influences viscosity and the way paint holds together in suspension as well as on paper. Thankfully, there’s a really good and upto date database available online that includes many of the most common brands of art supplies. Double Check Vegan is a great starting point if you are in the market for art supplies and want to make sure that they are vegetarian or vegan. Many artists have also contacted brands as individuals to double check ingredients and production methods. If you have a favourite brand or product, do get in touch with the manufacturer to check to see if it is vegetarian or vegan friendly, the more people ask, the more likely it is that the industry will respond by labelling art supplies in a clear and detailed manner, and developing new lines to meet demand. If you’re in the UK I recommend you check out Jackson’s as they have taken the time to mark their products as vegetarian/vegan friendly on their website. You can specify ‘vegan’ as a search term. This is an amazing feature and a company I’ll be supporting as and when I need new products! I am a watercolour beginner, and so my requirements may well be different to yours. Currently I am using an ordinary hardback notebook from WHSmiths for sketching. The paper is plain, white and uncoated. It’s not particularly thick and it’s not designed for watercolour but it’s fine for pencil and ink sketches and, should I decide to recycle it one day, that will be easy enough as it’s made from paper and cardboard. I am not yet experienced or skilled enough at watercolour painting to justify spending lots of money on artist grade paper. As such, I use 200GSM heavyweight cartridge paper which I picked up at Cass Art, my local art shop. It’s rated as ‘suitable for pen, pencil, charcoal, oil pastel, print making and light washes of acrylic, gouache and watercolour’. 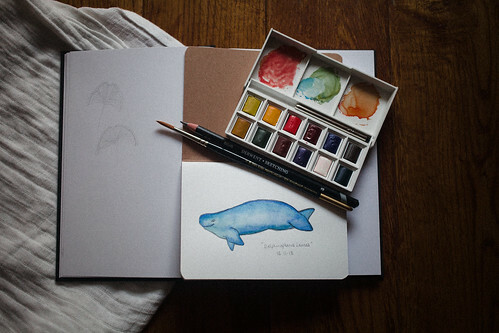 If you’re in the market for artist grade watercolour paper, Double Check Vegan has some suggestions including paper by Strathmore and Fabriano. Watercolour brushes are quite easy to come by, as there are lots of options for synthetic brushes. I use Pro Arte Prolene Series 101 synthetic brushes and have two, one size 10 and another size 6. Again, I bought these at Cass Art (no affiliation). I’ve seen some people complain that they don’t hold their shape, but they’ve held up perfectly for me. I never leave them head down in water or in storage, don’t scrub at my watercolour pans, and use the original protection caps to keep the bristles straight. Once I have finished painting with them I simply wash them in clean water, reshape the bristles into a point with my fingers and carefully slip on the cap, then stand them upside down on their cap to make sure that they dry properly. Six months in, they still come to a point beautifully. At the moment I have just one simple set of watercolour paints (pictured above), and this is the pocketbox by Winsor and Newton in their Cotman range. The Cotman range is student grade, and all but three colours (Viridian Hue, Raw Umber and Ivory Black) are vegan. I am interested in trying other watercolour paints as I get better and have been curious what professional artists and advanced hobbyists do about sourcing high quality paint that is vegetarian or vegan friendly. From my initial reading and research, brands and lines I am curious to try include Schmincke and their Akademie line, Ecoline, Holbein and ShinHan. These aren’t the only vegan / cruelty-free paint lines, but they’re a good start and it seems that there is quite a bit of choice. I use pencils made by Derwent. I have a sketching set Ed bought me for my birthday last year, they’re all simple graphite. I also have a set of Derwent Academy watercolour skintone pencils which I believe to be vegan based on the rest of the Derwent pencil range. I hope this has been of help to you in sourcing vegan art supplies for watercolour. It is my hope that with time art supplies will be listed in the same way that cosmetics are, and that companies will come to view having a high quality vegan range as a badge of honour to shout from the rooftops about! I wouldn’t have thought it possible back in 2005, but there’s much more demand these days which is wonderful to see.